This is a piece that I started in a new application, called Rebelle. 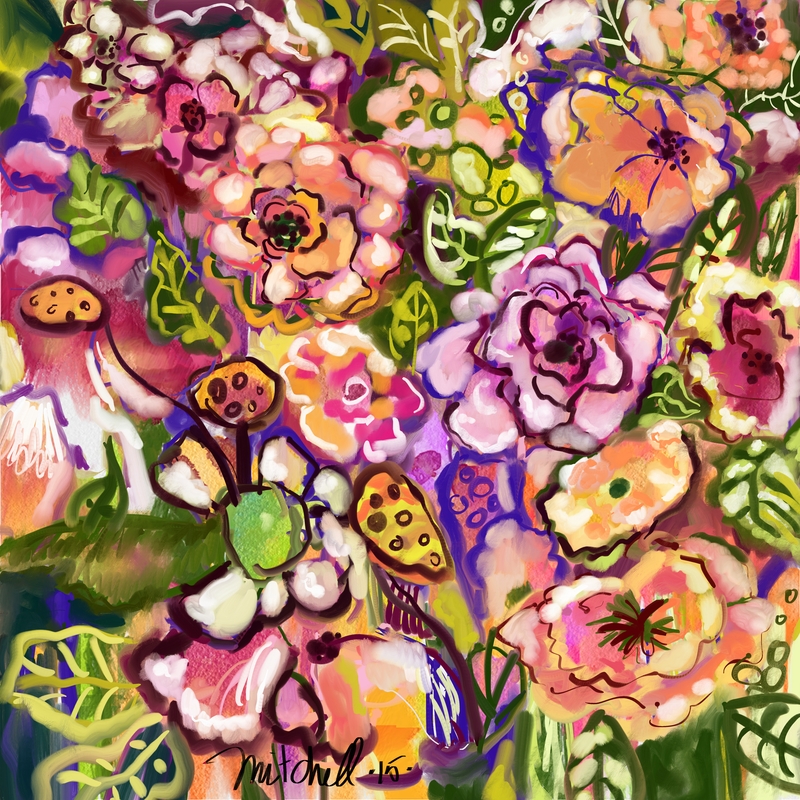 Rebelle is basically a watercolor digital painting program. It is unbelievable! I have talked about it in my last two blogs. It makes watercolors and inks that flow and drip just like in the real world. In Rebelle, I laid down a layer of acrylics and then used the water to make drips coming down all over the page. I also used the ink brush to add more details and drips. Then I brought this into Painter and used oils to paint in the flowers and leaves. This is another break-through piece for me. It is loose and flowing. Something I have tried very hard to get in my work. I also managed to keep good light and dark values going in this piece. Another thing that has challenged me for quite some time. This is gorgeous, Kerry. A question: You mention the layers of acryclic, water color, and then oils. Is this something that could be done in the actual media, or has the computer allowed you to mix media in new ways? Hi Carole. One can mix actual media. But not really watercolor and oils. I can change papers as I move from one media to another. So when I use the watercolor a, I use a textured watercolor paper. Then for acrylic and oil, I switch to something without the texture. Good question. Thanks for stopping by. Hi Peggy. Thanks for stopping by! I like this a lot. It’s a joyful mass of summer glory. The flowers have a kind of decadence about them – of the sort I generally associate with weeds! (And I mean that in the best possible sense. Weeds are cool!) The way you have used the lights, darks and detail, particularly in the upper half of the painting, really give it depth, which all adds to the effect. I’m glad you are pleased with it. You have every reason to be. Thanks so much for your comment, I appreciate it. Awesome piece Kerry – you’re mastering controlling the medium and it’s having wonderful effects. I do like the composition and which areas you’ve chosen to highlight. Thank you so much, Mary. I’m finally painting like what I see in my mind.